I appreciate Fall more here in Michigan. yellow, orange, gold, amber and red. In Los Angeles the leaves mostly turn to brown and then falls off. then that's where you see the same beauty of fall, Michigan have. Fall weather is just perfect for me. I love the cooler mornings and crisp nights. We woke up to a rainy morning. I love rain as long as I don't have to go out and drive. Curling up in bed with my little 3 year old Taz. Watching his PBS kids shows. Little Taz said "Mommy my Tummy is talking." My signal to get out of bed and make something. And what's my craving for this rainy day? a hot and thick drink, made from masa, piloncillo, water or milk and which occasionally contains chocolate, cinnamon, anise seed and/or vanilla bean. This is one of my childhood breakfast favorite or after school snacks. In a medium saucepan, pour water, add rice, and bring to a boil over high heat. Reduce heat to low, simmer for 15 minutes, constantly stirring to avoid rice from sticking at the bottom of the pan. Stir in coconut milk and salt, simmer for another 15 minutes. Add chocolate, and sugar to taste. Blend well. If you don't like coconut milk, you can substitute it with evaporated milk. 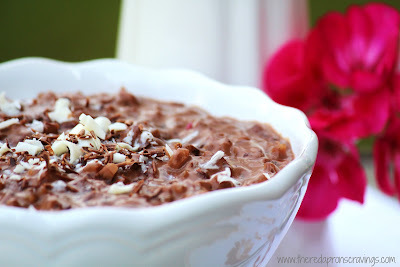 My children like to top their champorado with chocolate shavings, and I like to pour mine with evaporated milk on top. 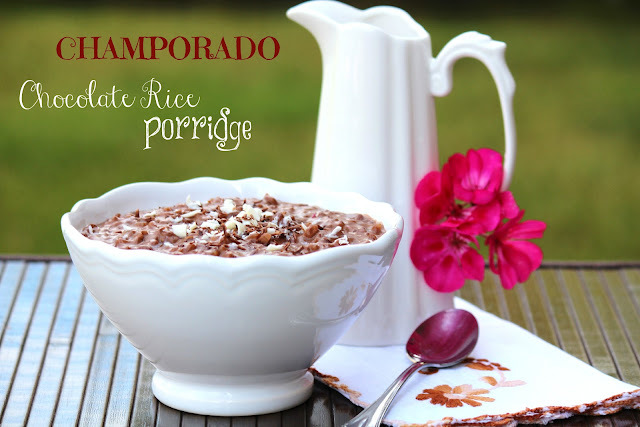 In some Provinces in the Philippines they like to pair champorado with Tuyo, a dried salted herring. Reminds me of my childhood as well. Like you, this is one of my colder days cravings. but now it has become a snack food for myself and my family.